Our bird walk on Saturday at Van Cortlandt Park got off to a great start when I scoped out 2 Wilson’s Snipe (Gallinago delicata) in the enclosed area on the parade grounds. I tried to get a few folks who had arrived early for the walk to get on the birds, but the Snipes took off just before they got on the scope. While they were able to see the Snipes in flight, it would have been nice to get ground views since it would have been a life bird for most if not all who were present. Encouraged by the discovery, I took our group around the lake looking for other migrants as well as the Red-necked Grebe (Podiceps grisegena) that some of had seen last week. It was noticeably quiet and we did not have much activity around the lake and neither did we find the Grebe. As we made our loop near the golf course, I heard an incomplete but recognizable song of a Yellow Warbler (Setophaga petechia). After a while, I pinpointed the area, but then got distracted by the song of a Warbling Vireo (Vireo gilvus). The Vireo was closer, so I focused on getting the group on it. After some work we all got looks at the Warbling Vireo and then it was onto the Yellow Warbler. That took some work, but we managed to pull it off and everyone had good looks. 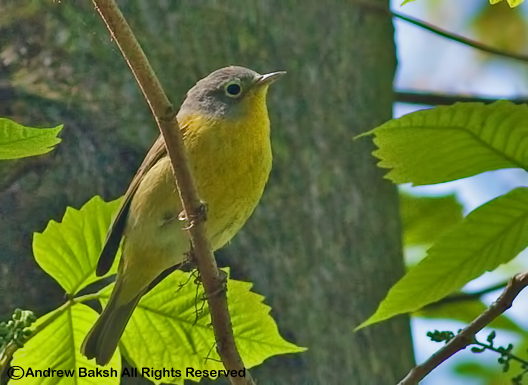 Nashville Warbler photographed at Van Cortlandt Park status is "Rare" for the park. We then made our way up into Vault Hill and then into the North West Forest picking up several Blue-gray Gnatcatchers (Polioptila caerulea), Yellow-rumped Warblers and a distant Osprey (Pandion haliaetus). In the North West Forest, it was a drastic change from last week when we had Kinglets and Yellow-rumpeds singing everywhere. It was quiet save for a few Yellow-rumped Warblers singing and Northern Flickers (Colaptes auratus) interacting with each other. 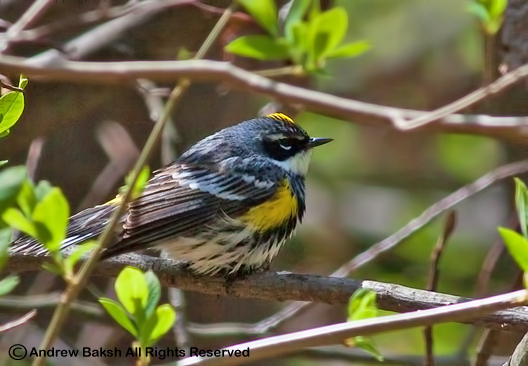 Nevertheless, we worked the forest looking and listening and our work paid off when a singing Nashville Warbler (Oreothlypis ruficapilla) betrayed its presence. I worked the area where I heard the song and got the group on the bird. In that location, we also had a House Wren (Troglodytes aedon) who scolded us for disturbing the peace. With apologies to Troglodytes aedon, we left and continued birding; eventually, making our way out of the forest. As we exited the forest, the chatter of a Baltimore Oriole (Icterus galbula) was heard and we worked until we got looks at yet another new spring arrival. We gave the Van Cortlandt Lake another look, but again did not find the Red-necked Grebe. We ended our walk shortly after. Below is a complete list of species seen. After a few hours of birding Jamaica Bay Wildlife Refuge in Queens this afternoon, I was working over a flock of 23 Glossy Ibises (Plegadis falcinellus) near the West Pond edges when I noticed other Glossy Ibises arriving from the marsh. 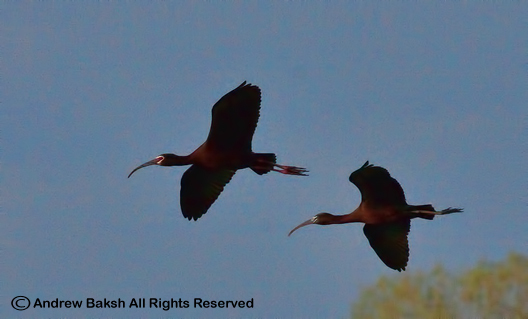 I put up my bins to scan the incoming birds and spotted a White-faced Ibis (Plegadis chihi) in the group. Luckily, I had my camera out and so I fired off a couple of shots and got a few with the bird as it came in. Thankfully, it settled in and I also got some digiscope shots as well. Here are a few photos. 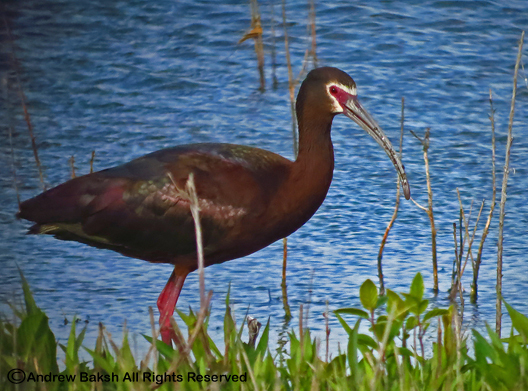 White-faced Ibis in flight at Jamaica Bay Wildlife Refuge Queens NY. 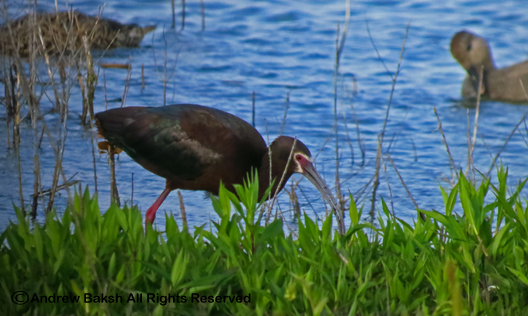 Digiscoped White-faced Ibis at the West Pond, Jamaica Bay Wildlife Refuge Queens NY. Today, I was back in the Bronx to lead my Saturday morning walk at Van Cortlandt Park. I setup near our meeting area, the ranger station, next to the parade grounds and began to scan the fields while waiting for the attendees to show up. It was not long before I picked up a couple of Savannah Sparrows along the eastern edge of the fence that surrounds a section of the field and I immediately tried to get two of the early arrivals on the birds. We relocated for a better angle with light and observed that the Savannah Sparrows had increased in numbers to 9. 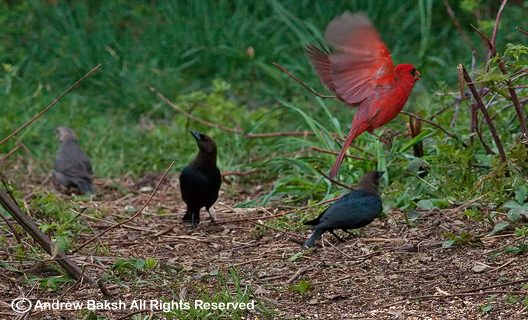 Soon, other birders arrived and got in on the action. 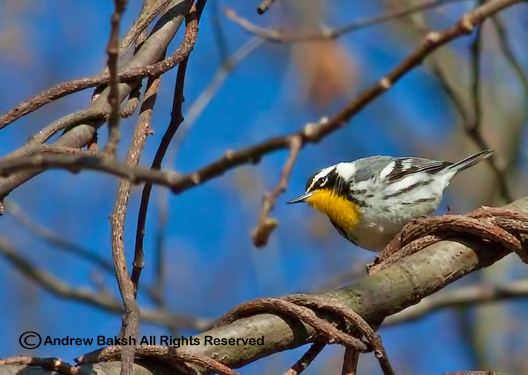 Digiscoped Eastern Meadowlark - a new bird for our Van Cortlandt Park Bird Walk. While others observed the Savannah Sparrows, I scanned the field for other possible migrants, hoping for an Upland Sandpiper or Eastern Meadowlark (Sturnella magna). Neither species were ever seen on the walk, but I am always hopeful to add to our growing list of birds that we have seen on the walk. We had pulled away heading towards the lake when another of our regulars, Hilary Russ, showed up, “right on time chuckled Alex Pirko”, another of our regulars. Reluctant to leave without giving Hilary a chance at seeing the Savannah Sparrows, I turned back and scanned the area we had just seen the birds. I found a few Savannah Sparrows feeding on the field and got Hilary on them. Just on principle, I gave another scan along the fence and saw a flash of yellow that gave me a start. Meadowlark…it had to be, was my thought. 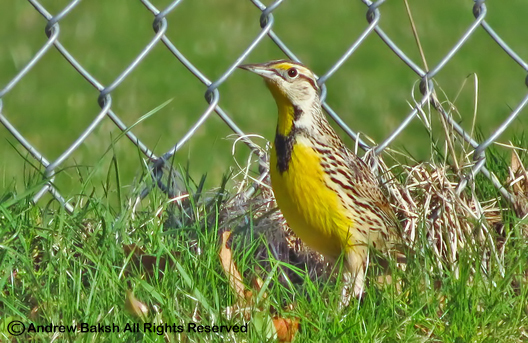 I kept my eyes on the area and sure enough, a lone Eastern Meadowlark poked its head up from behind a tuft of grass. I quickly gathered the group together and we all got good looks. Red-necked Grebe - another new bird for our walk and possibly a 1st for the Park. We moved in closer and got better looks, plus some photos, which I was keen on getting since it was a new bird for our walk. We then left the parade grounds and took the Bridle Path that leads into Putnam Trail skipping part of the Van Cortlandt Lake, which is covered by the John Kieran Trail. 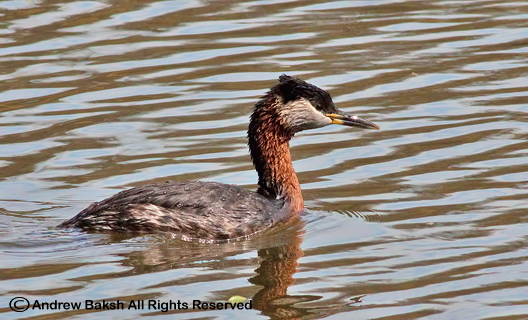 As a result, we missed picking up a Red-necked Grebe (Podiceps grisegena) that was reported to be on the lake. While, we did look for the Grebe from the bridge we could not see all the way to the South End and birding the inside trail would have given us an opportunity to check the edges. Much later, we made amends; after a long hike in the North Woods, a few of us made it back to the lake around 2:15 p.m. to find the Grebe thanks to a phone call from Alex Pirko who left the North Woods earlier than us. I had asked Alex to take a crack at finding the Grebe on the lake and he came through. The Red-necked Grebe was another new bird for our walk and could very well be a first for the park since it is not even listed on the "Birds of Van Cortlandt Park Checklist". 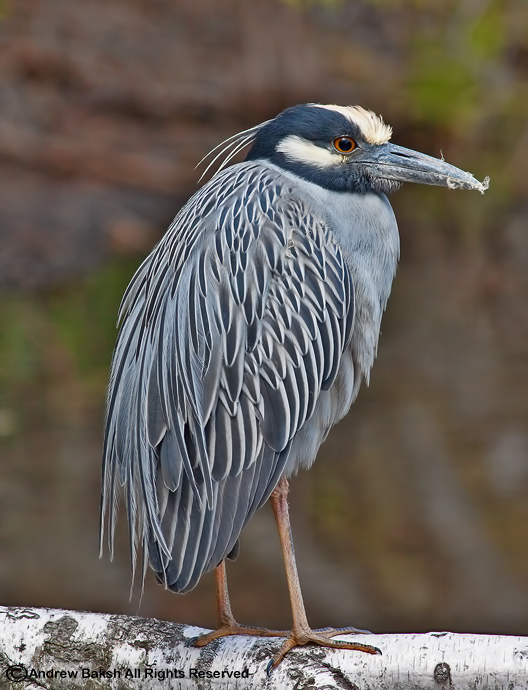 For those interested in these types of statistics, this would be bird number 147 for our Bird Walk, which is almost 62 percent of the 240 species that are listed for Van Cortlandt Park. 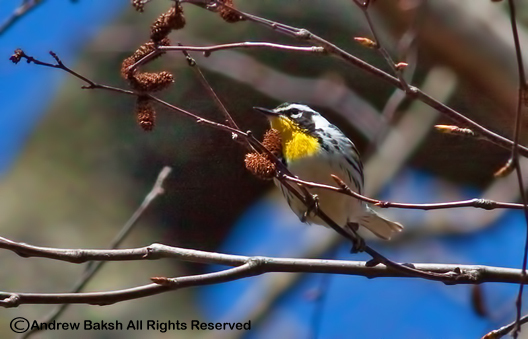 Yellow-rumped Warbler in the North Woods at Van Cortlandt Park. 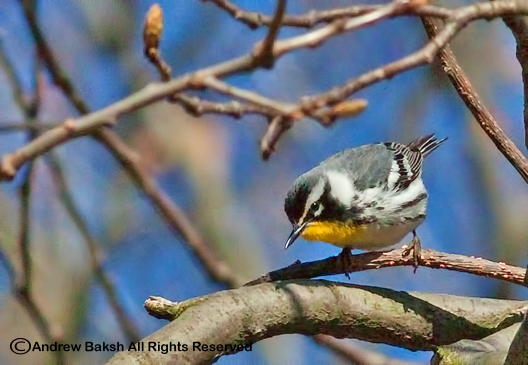 Other highlights from today's walk included, 5 species of Warblers along with 4 species of Woodpeckers, I had 5, given I had seen a Yellow-bellied Sapsucker (Sphyrapicus varius)on my way into the park. Lots of Ruby-crowned Kinglets (Regulus calendula) in the Northwoods, a conservative count was 19, the most that I have ever seen there since I began the walk; in addition, there were many Yellow-rumped Warblers and Hermit Thrushes. A total of 49 species of birds were seen today, see the list below. 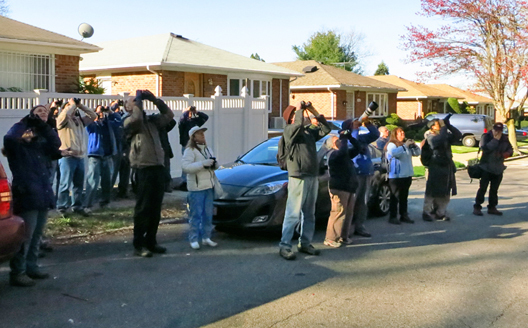 Some of the birders who came out for the walk, looking at the Yellow-throated Warbler. Last Saturday, my friend Eric Miller led a bird walk for the Queens County Bird Club at Alley Pond Park Queens. Given that it was expected a sizable group would attend, I decided to help him instead of going to Prospect Park in Brooklyn. We predicted the group was going to be huge, for two reasons. 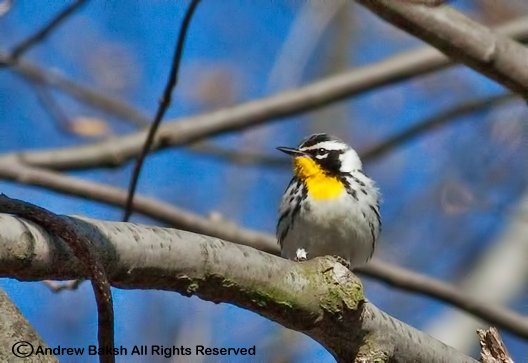 One, Eric is a popular naturalist and birder well known for his talents to find good birds; the second was a Yellow-throated Warbler (a not so common spring migrant) that was found at Alley Pond Park on Thursday by birder Booby Kurtz was still present. Many people who could not make it during the week were sure to come out on Saturday. 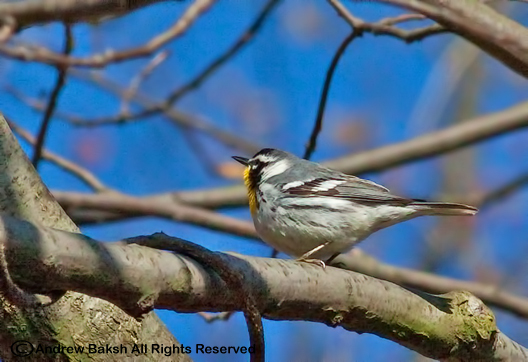 Yellow-throated Warbler was still around on Saturday, but has not been seen since. The crowd was 24 and counting on Saturday and the bird on everyone’s mind that morning was the YTWA. Happily, all who came out for the walk got excellent looks at the bird and a few who stayed with Eric and I until later that morning got to see and hear it sing. The birding while good that Saturday was not as productive as it was on Thursday as I noted that the numbers of Pine and Palm Warblers were down. A Louisiana Waterthrush (Parkesia motacilla) seen on Thursday was not seen on Saturday. Nevertheless, we managed to pick up several early spring migrants in Black-and-white Warbler, (Mniotilta varia), and Blue-gray Gnatcatcher, (Polioptila caerulea) . A partially leucistic American Robin was seen quite nicely giving those of us with cameras a chance to get some photos. 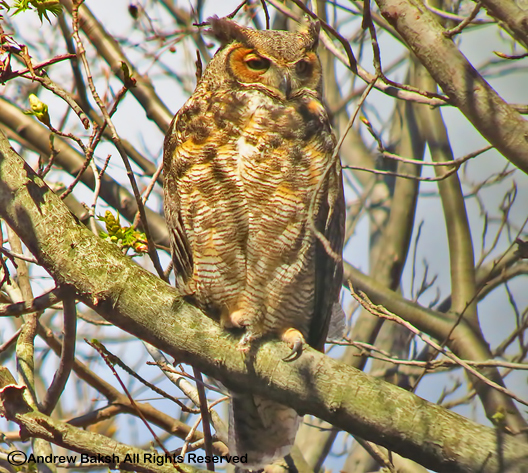 A Great Horned Owl, (Bubo virginianus) missed earlier in the walk, put in an appearance as some of us made a second pass around the kettle ponds. 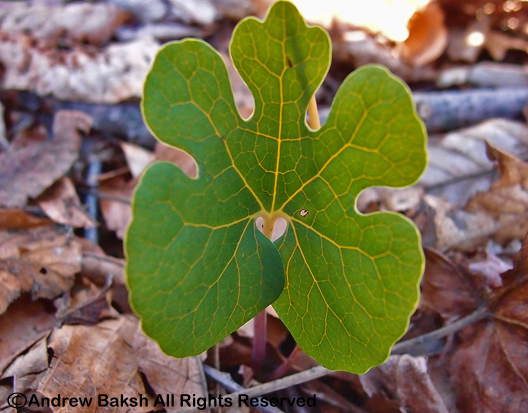 During our walk, we also took some time to look at plants such as Bloodroot (Sanguinaria canadensis) and Sessile bellwort or wild oats (Uvularia sessilifolia). While the trees were not dripping with birds, it was still a good day for bird watching in Queens. 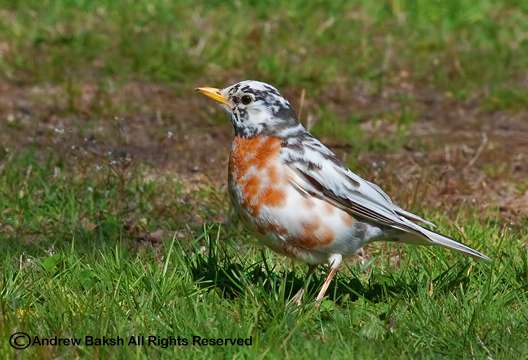 A partially leucistic Robin was one of the Alley Pond Park highlights. Bloodroot (Sanguinaria canadensis) has a nice flower when it blooms. 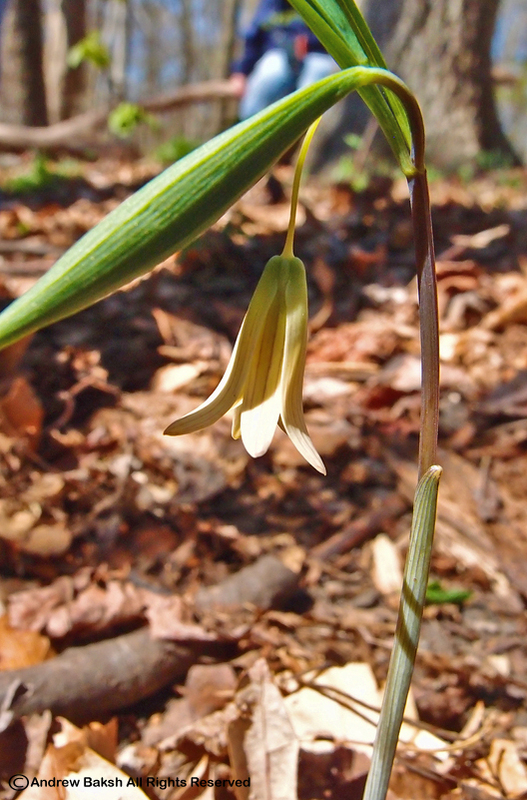 Sessile bellwort or Wild Oats (Uvularia sessilifolia). Ever get that feeling of deja vu? Well, I was starting to feel that way this afternoon when I got a phone call from Steve Schellenger (thanks Steve) who informed me that a Yellow-throated Warbler (Setophaga dominica) had been re-found this afternoon by Colleen and Bobby Veltri at the edges of 76th avenue and Cloverdale Rd near Alley Pond Park. 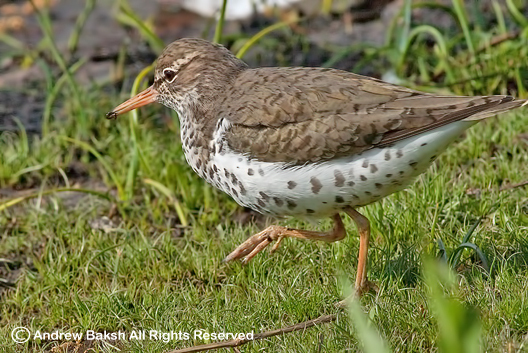 Was I going to be too late for this bird as I was earlier in morning? Time management came to mind as I put the sirens (imaginary ones) on and headed out to Alley Pond. 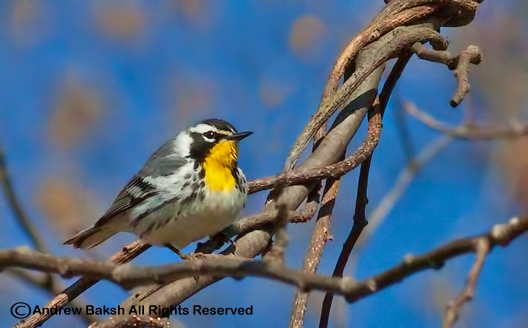 Earlier today, I had left for Alley Pond later than I wanted to; while on my way I had received a phone call from Bobby Kurtz reporting that he had found...you got it, a Yellow-throated Warbler. 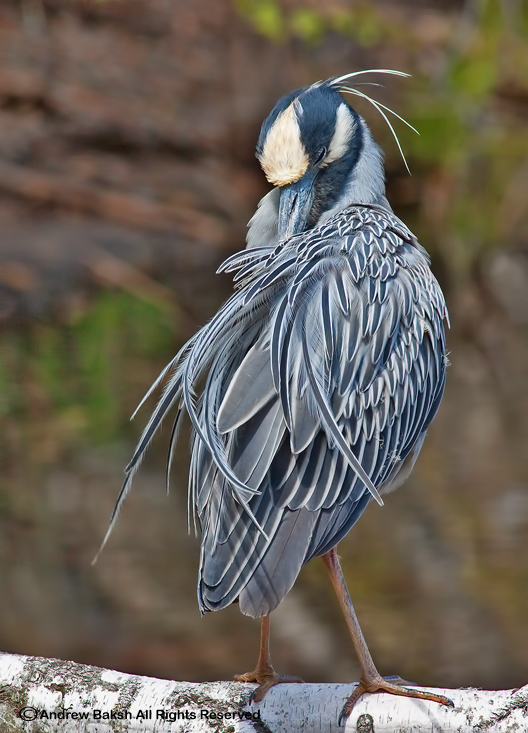 When I got there, Bobby had last seen the bird 15 minutes before I arrived. While searching, with Bobby and then Arie Gilbert who showed up sometime after I did, I heard what sounded like a broken song of a YTWA, but could not locate the source. Many other birders showed up and together we searched for quite sometime, but we could not find the bird. Bobby Kurtz indicated that he had the bird sing twice in the time he first found and observed the bird and I had heard a short/broken song, so we looked as well as listened to no avail. We consoled ourselves with looks at Louisiana Waterthrush (Parkesia motacilla), Swamp Sparrow (Melospiza georgiana), Pine Warblers (Setophaga pinus) and Rusty Blackbirds (Euphagus carolinus), but everyone's mind was on the YTWA. After several hours of searching we reluctantly filed out of the park. I indicated to the group that I would return to give it another go; Steve Schellenger and Arie Gilbert indicated that they were game for another search and would also return. About 45 minutes later, Eric Miller called to let me know that he was going to meet up with several other birders, that included Colleen and Bobby Veltri (the folks who later found the bird), to look for the YTWA. I indicated to Eric that I would join him in a few minutes, but then I stopped to run some errands (my good deed). Thankfully, no good deed goes unrewarded and with spot on directions from Arie Gilbert (thanks Arie), I arrived and got on the bird, plus got some photos, which I have included below. Based on the look and photos, this appears to be the short-billed, white-lored D. d. albilora type which breeds in Sycamores throughout the Midwest. 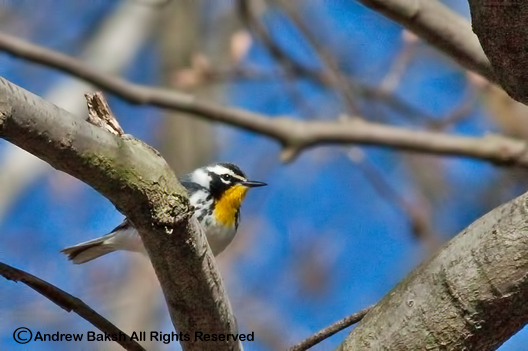 I totally enjoyed this bird, soaking in the fact that this was a much nicer look than my first Queens County Yellow-throated Warbler; it was also neat that I was able to get on the first YTWA for region 10 in 2012...plus it was in Queens. 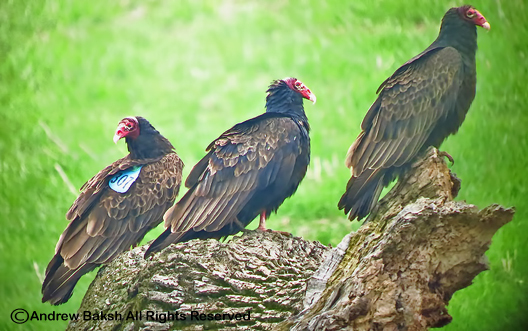 I have an update on the banded/tagged Turkey Vulture that I photographed on Sunday, which I posted online on Monday. 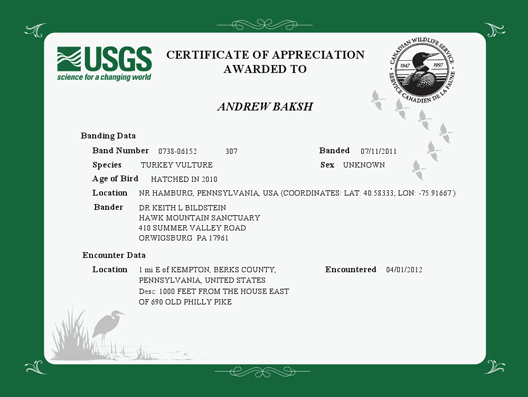 Yesterday, I received a certificate from USGS (United States Geological Survey) which indicated that the subject was a hatched bird from 2010 and was banded in PA. See certificate for more information below. 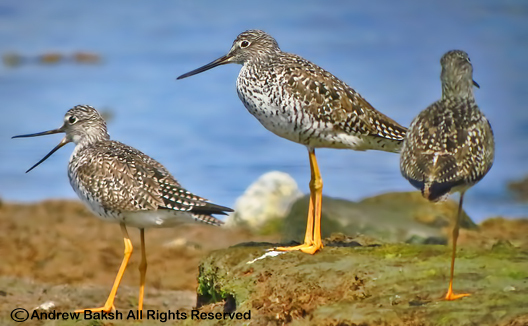 I hope by posting photos of banded birds and the information gathered in reporting such sightings, will encourage more observers to submit reports of their findings. This weekend while tracking down a Louisiana Waterthrush (Parkesia noveboracensis ) in Queens, with my friend Eric Miller, he mentioned that he and another friend, Jeff Ritter, were going to make a run at a Green-tailed Towhee (Pipilo chlorurus) that had eluded them the prior weekend in PA. 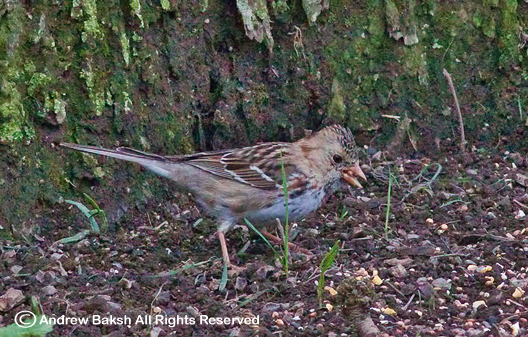 They were also possibly going to chase a Harris's Sparrow that was also in the area. Both birds would be lifers for me, so of course I was intrigued. It did not take much to convince me and so I joined my fellow Queens birders on Sunday for the run to PA.
We met around 6:15 a.m. and with Jeff at the wheel, we headed off to eastern PA. Having missed the Green tailed-Towhee the prior weekend, Jeff and Eric were hoping that the weather being a bit cooler this weekend would encourage the Towhee to be lured out to bird seed. We arrived at Blue Marsh Lake in PA, a little after 9AM and immediately heard a singing Field Sparrow (Spizella pusilla) and the chip notes of nearby Palm Warbler (Setophaga palmarum). On our walk up the hill past the dam, we found at least 2-3 singing Palm Warblers. Further into the trail we heard a singing Ruby-crowned Kinglet (Regulus calendula), which kept out of sight even though we tried to coax it into view. More Palm Warblers, Eastern Bluebirds (Sialia sialis)and Eastern Phoebes (Sayornis phoebe) were also seen as we worked our way towards the spot where the Green-tailed Towhee was reported. Jeff and Eric seemed very encouraged at the birding activity near the area where the Towhee was reported to be frequenting and remarked that the prior weekend there were no birds around that area when they were there. We noticed the empty hulls of bird seed that someone had put in the area and Eric sprinkled some more that he had brought with him. Then we began the waiting game. I was satisfied that with Eric and Jeff neither of them were going to get antsy after a short wait as they are both patient birders. 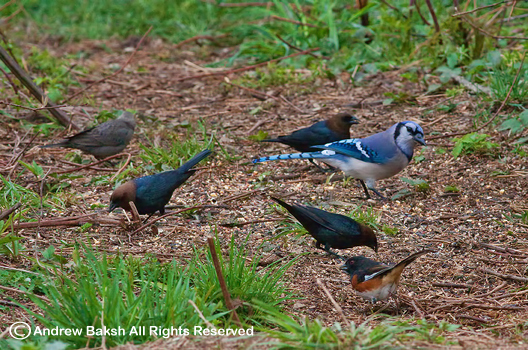 We all waited patiently and during that time enjoyed ourselves observing many of the other birds that showed up. We also did quite a bit of birding by ear and an observer unfamiliar with our lingo would have been quite amused to hear anyone of us call out a bird and ask if the others had heard it. Among the birds seen during our wait included several singing Field Sparrow (only one provided a poor view) an immature White-crowned Sparrow, several Carolina Chickadees (Poecile carolinensis) which created quite the discussion once we heard the call and began to analyze that it did not sound like the Black-capped, call of "Cheese Burger, Cheese Burger". Jeff checked his Sibley Field Guide and commented that the birds appeared to be further north of the range for the species, so it will be interesting to see the feedback we get from the PA list serve once Jeff submits his report. 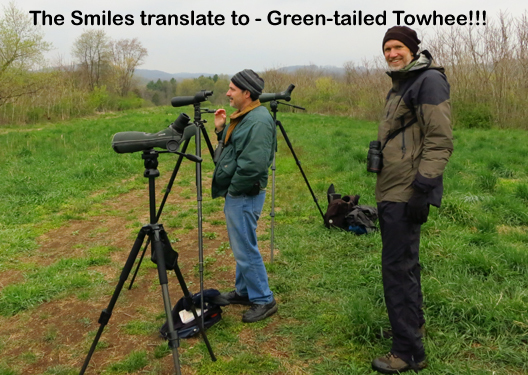 After about an hour and a half, a discussion began about the plumage of the Green-tailed Towhee. And we were looking at Jeff's Field Guide, when suddenly Jeff announced that the bird had arrived. We all quickly got on the bird which only stayed for a moment before hopping into the bushes. We continued to wait, hoping for another look and were rewarded after about another 15-20 minutes, when the bird came out again for a bit longer, but not by much. We all got on the bird pleased at the second look. We hung around hoping for a third look and for more photos, but Jeff keeping both Eric and I in check reminded us that we were on the clock with time counting down to go look for a Harris' Sparrow. 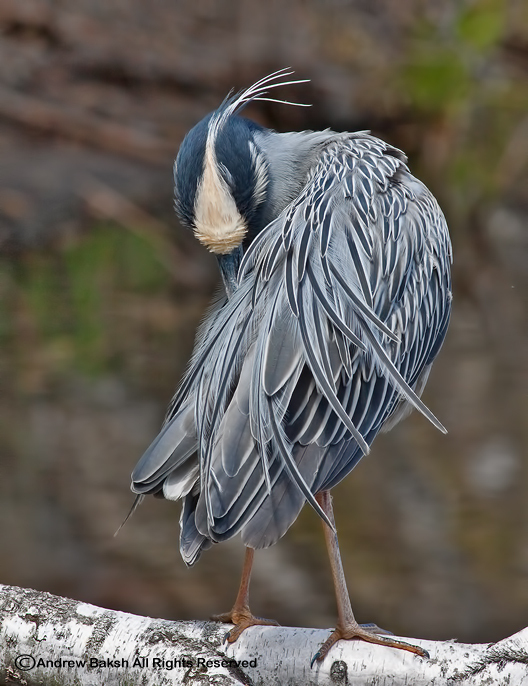 Eric and I both got a chuckle at Jeff remarking about keeping the two us in check, as we both are guilty of wanting to pore through every nook and cranny when birding; sometimes that works against good time management when birding against the clock. Other good birds in the area included a Kingfisher (heard only) and a Northern Rough-winged Swallow) (Stelgidopteryx serripennis) among many Tree Swallows (Tachycineta bicolor). Before we went for the Harris's Sparrow, we stopped at Kaercher Creek to look for a previously reported White Ibis, but we did not find it. Here we had another look, in better light this time of another Northern Rough-winged Swallow among several numerous Tree Swallows. We also spotted and photographed a Wood Chuck, one of the biggest we had ever seen. Then we continued to 690 Old Philly Pike where according to directions we had to look for a Shagbark Hickory tree that was about 400-500 feet from the address adjacent to the road. We again looked for evidence of bird seed to help us out and we found the spot using this strategy. Eric put out the remaining bird seed he had and then we waited. 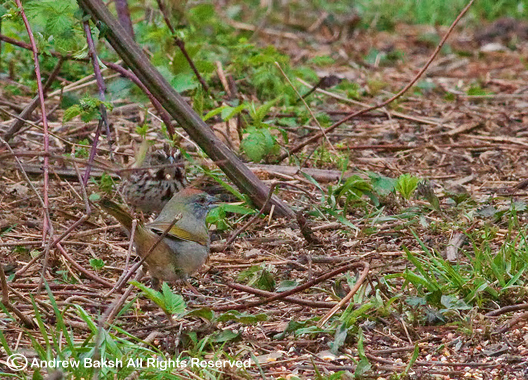 The Harris's wait was not as long as the Green-tailed Towhee and in about 20 minutes the bird showed up near the base of the tree. Traffic while not plentiful made the birds skittish and the Harris's Sparrow did not stay in the open for long. However, it made several short appearances, which provided excellent looks. 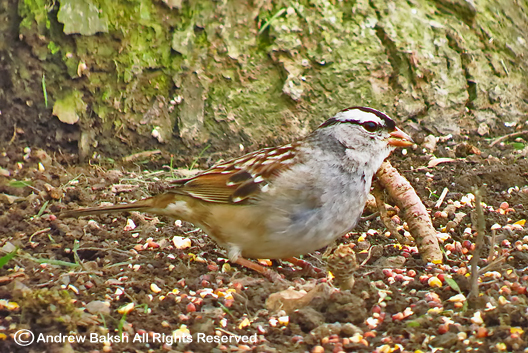 Other birds of note seen in this particular spot, included an Adult White-crowned Sparrow. Nearby, we observed several roosts of Turkey Vultures (Tachycineta bicolor) and saw several Black Vultures (Coragyps atratus) flying around as well. 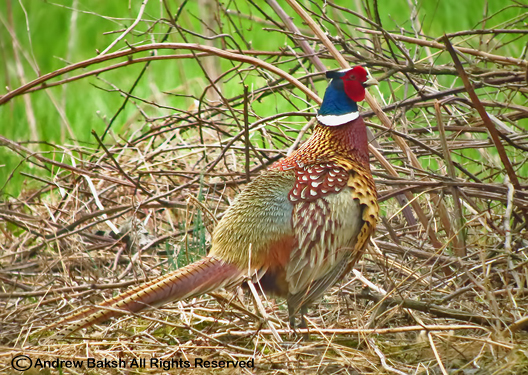 A male Ring-necked Pheasant (Phasianus colchicus) came out in the open and called ever so often startling the Turkey Vultures into leaving their perch. We soon left the area and birded in New Jersey on our way home stopping at Spruce Run Reservoir to look for an Eared Grebe that was reported in the area. At this location birds of note, included Savannah Sparrow, Vesper Sparrow, Swamp Sparrow, Wilson's Snipe, 5 Red-necked Grebes and a White-winged Scoter, but no Eared Grebe. 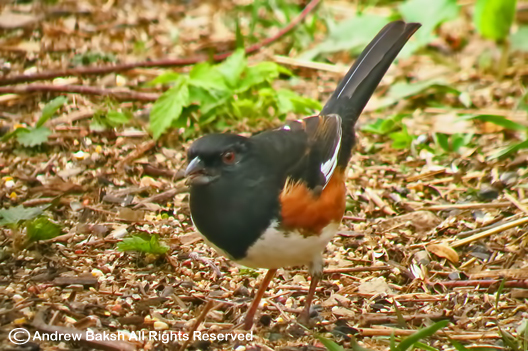 For anyone interested in statistics, we reviewed our field notes on the way home and concluded that we tallied twelve species of Sparrows for the day that included Green-tailed and Eastern Towhees and Dark-eyed Junco. It was a very fun day birding with Jeff and Eric while picking up two lifers; it is not often one could do a 2 for 2 in the field when chasing rarities.